A few weeks ago I got an email from Blue Orange Games asking if I would be willing to review an upcoming children's game. Being a gaming father of four younger gamers I said "YOU BET"! A few days later Fast Flip shows up in the mail. Like similar Blue Orange titles Fast Flip came in a small bright tin case and I knew right away we would like it. Let's see why. Fast Flip has three different games in one which I will go through. Set up for all three games is a breeze. In game one you simply shuffle the cool triangle cards and place them so all the different fruit figures are face up. Tada, you are done setting up. I hope you didn't get too tired. Set up for a 2-8 player game. There are no turns in any of the versions of Fast Flip, each player will play simultaneously. Play for Game 1 begins by turning over the first card and placing it next to the deck. 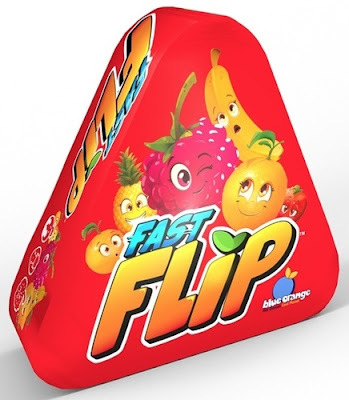 Players then race to identify the fruit or number associated with the flipped over card. In the Example below a strawberry is flipped over. Players will now try to figure out how many strawberries are on the face down card (with all the fruit on it). In this example there are two strawberries. The first player to correctly identify and call this out wins the card. how many are on the non-flipped over card. Players will now flip over the next card. In the example below a number has been turned over (5). Players now race to identify which fruit shows up five times. In this case it is Raspberries. The player who called this out would win this card. out which fruit shows up five times on the other card. Play continues like this until one card is left in the deck at which time players add up the number of cards they won, the player with the most cards wins! Set up is similar for Game 2 except now the tokens are placed in the center of play as well. Game 2 already in progress - first card is flipped. Game 2 is also played similar to Game 1 except instead of collecting the card when you correctly identify the answer you take the matching token. For example in the image above the correct answer is 4, so the player who saw this first would take the "4" token and place it in front of them. Tokens can be grabbed from the center of the table or from other players as the game goes on. The first player to grab four tokens wins! Like Games 2 players shuffle the deck placing it face down in the center of play adding the tokens except this time the tokens are arranged in a random straight line indicating what players will be looking for each turn. That is right the backs of the cards will no longer matter. Set up for Game 3 of Fast Flip. Play for Game 3 is the same except now you are looking at the first token to determine the match you are looking for. For example in the image above the number 1 is the first token, so players will be looking for what fruit only occurs once on the card. In this case it is the Pineapple. The player who correctly identifies this will get the token. Play then proceeds by flipping the next card over and looking at the next token (the pineapple in this case). Play ends when all ten tokens are taken, the player with the most tokens wins! There you have it three fast paced games from one tin! At it's core Fast Flip is a speed matching game, similar to Blue Orange's other hit title—Spot It! Where Fast Flip differs is with what is being matched. Instead of just an image players must count first then shout out the match. The artwork is very cute and works well for the intended audience. The components are of the highest quality from the cards (loving the triangle die cuts), the tin case, to the tokens which are thick and sturdy every part was well done. Fast Flips works well with younger children, plays quickly, and has a very small learning curve making it easy to get to the table. As mentioned above the components are top quality and the art is wonderful. Although the tin says the game is for ages 7 and up I find it perfect fit for families with kids ages 4 - 10. Easy enough for the younger kids and still challenging for the older ones because of the speed element. I love games that can help my kids learn while they play and Fast Flip delivers as it teaches kids counting, pattern/object recognition, and speed thinking. My kids ages 3, 6, and 8 also really enjoy this game and ask to play it repeatedly. This one will go into our collection as our kids are still in the perfect age range. Spot It, Blink, and other speed games will love Fast Flip! I am giving Blend Off! 5 out of 5 super kid meeples.